Before looking at outcome learning from the perspective of the manager, the developer and the employee in the next posts, I need to clarify some of the elements I use in this approach. The first step in ‘making e-Learning work’ is to create meaningful objectives. Far too often progress and completion of e-Learning courses are measured based on the percentage of the pages you have viewed. This is not only meaningless from the perspective of the learner, it is time-consuming and it will not give any useful feedback to the e-Learning developer or the manager. Therefore we need to turn away from ‘course progress and completion based on page views’. The alternative needs application on the whole field of corporate learning: external courses or studies, instructor led training, social learning, e-Learning, et cetera. And these goals should have meaning for the manager, the developer and the employee/learner. My alternative for page counting is progress and completion based on Learning Objectives. When you want or need to learn something you need to will have learning objectives. Progress is the extent to which you have reached your objective(s), completion is when you have reached your learning objectives the ‘Learning outcome’ is the score you have reached on your objectives. Learning objectives will do a lot more than just offer a mean of meaningful progress measurement. They can play a central role in the whole e-Learning process; they are the glue that links all elements together. Learning objectives are used to translate a manager’s policy into clear directions for e-learning developers. It will give E-learning developers clear targets what learning opportunities to create. For an employee it will function as a filter to select appropriate learning opportunities and learning objectives will make an e-Learning course truly adaptive. 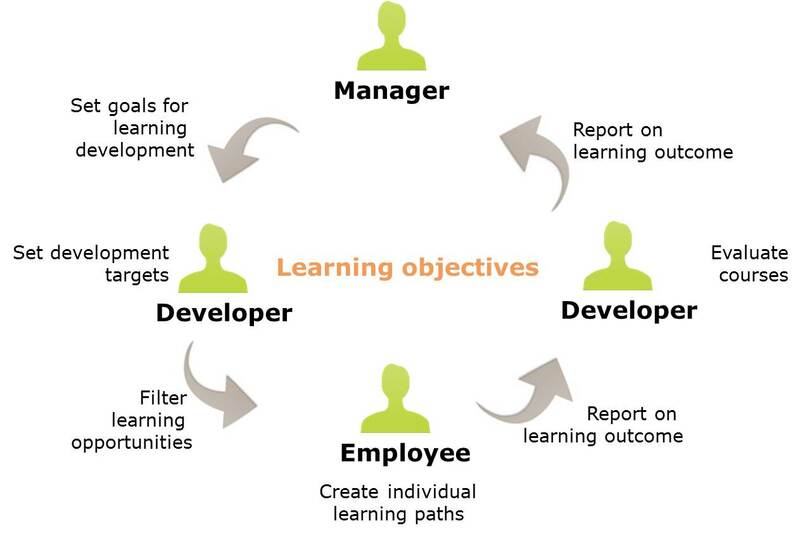 Furthermore Learning objectives will be used to report on the learning outcome (through a LMS) and for the developer to evaluate the courses and finally it will offer the developers a way to report to their managers and for the managers to have a better understanding what their ROI on learning activities is. The second point is to let go (as a manager or an e-Learning developer: leave responsibilities where they should be. I’m a manager myself and I believe very much in the theory of Filip vandenDriessche. The basis of his theory is that as a manager you have to be firm on goals and criteria but you don’t interfere with solutions. The people that work for you are far better in finding the solutions; it is their job. There is a great lesson there for all managers (see my blog on his theory), but this goes for e-Learning professionals to. In the e-Learning field we make a lot of decisions for the learner instead of facilitating them. I recently even read a blog on how to formalize informal learning, this is nonsense. An e-Learning developer shouldn’t want to control the learning process instead he should facilitate the learner in as many ways as we can; it’s the learners responsibility if and how he uses this. I have to say that my own company easygenerator made the same mistake. We created an option to navigate based on learning outcomes; unfortunately the navigation is a link to a specific page, directing the learning automatically to that page. We now are working very hard to chance that link into an open study advice. As a company you need to have a clear vision on education, training and HR in general, but that is not enough. This vision needs to be translated into a ‘learning culture’ and a ‘learning landscape’ that supports this. This is partly about tools and platforms that you need to have to facilitate the learning process, but mostly about how you as a company value learning. If you have a ‘learning culture’ people will start to use (or demand that you facilitate) all kind of tools. Creating a learning culture is far more difficult than getting a learning framework. In a company without a learning framework but with a culture that values learning and encourage it, people will be focused on learning. In a company with a brilliant learning framework, but without a learning culture the learning outcome will be far less.